by Burton, Sharon C.; Shelton, Nelda J. This market-leaderhelps students acquire the office and interpersonal skills needed to excel in any organization. Its proven approach means students acquire these skills quickly and chapters introduce a range of topics including file management, time management, employment skills, basic financial forms, problem solving, human relations and more! 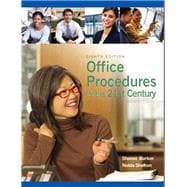 This edition features more on communication, references Microsoft Office 2007, and expands the office simulation to include both functional and cumulative exercises. New chapters address the medical and legal office and new assignments develop employer-ready skills.